Walk, run, cycle. Everyone welcome. Location: Bansko, Najden Gerov Str., 370m (450m walking) to the Gondola, 5 minutes to walk ( Really! SEE FOR YOURSELF ). The historic Bansko centre is just a 15 minute walk. Demianitza is steeped in the spirit of ancient Bansko whose history stretches back over 500 years. The stunning natural scenery is bathed in crystal clear air scented with the fresh fragrance of the evergreen pine trees. Description: Completed in 2009 and offers 61 luxury apartments in a prime location only a 5-minute walk to Gondola lift station. All apartments afford a beautiful mountain view of the Pirin or Rila Mountains. The Complex: The complex stands on an area of 2300 square meters. It faces south-southeast and has a magnificent view up to the Pirin and Rila Mountains. 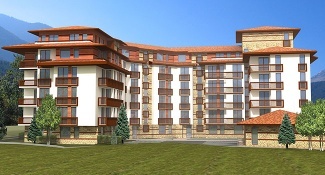 The complex is built in a crescent moon shape that guarantees sunshine and clear mountain views to all apartments. The complex has been designed by the Architectural studio Ergo Design Ltd. and architect: Ivo Samuilov. Activities: skiing, snowboarding, extreme skiing, walks in Pirin National Park, bathing (hot mineral water springs nearby), restaurants, sightseeing.